Sometimes I have tried a different approach to a batik and I have started working with the black fabric and gone through many stages of bleaching out and re-dyeing color in. 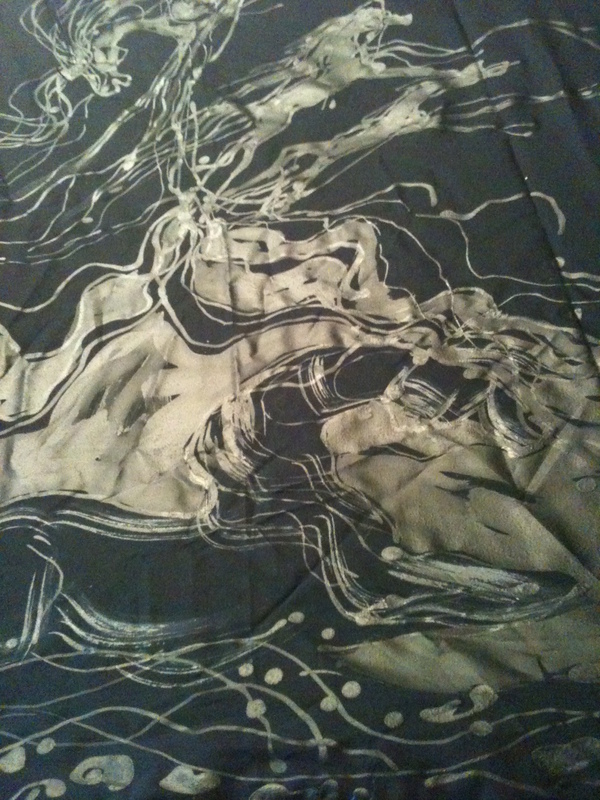 This first photo shows a picture of the wax on the black fabric in the beginning of my batik, Caught in the Thunderstorm. The strange thing about looking at it here is that where the wax is looks light colored, but this is the section that is holding the black color pure as it goes into the bleach. This next picture shows the batik after it has gone through several dyebaths to lighten it and I have accepted and protected some sections with wax to achieve this look. Every single piece of black fabric will have a slightly different response to bleaching. This particular fabric chose to leave rusty colored stains in the fabric, and light beige. Some might bleach out to a much lighter color. Others might have a tint of purple or blue remaining. It always will be a surprise. Never try this with silk as the bleach will disintegrate the silk. Here, in the third picture (below), I have painted dyes in to the areas that I want to change the color on. More wax has also been added to the batik to save the buff and rusty stain colors that I want to keep. It now is waiting to be protected to go into the dyebath for more colors to be added. Below is a close-up image of the bottom of the batik with dye painted on it. It will now go into more dyebaths and I will protect sections of these colors with the tjanting and brushes with wax. 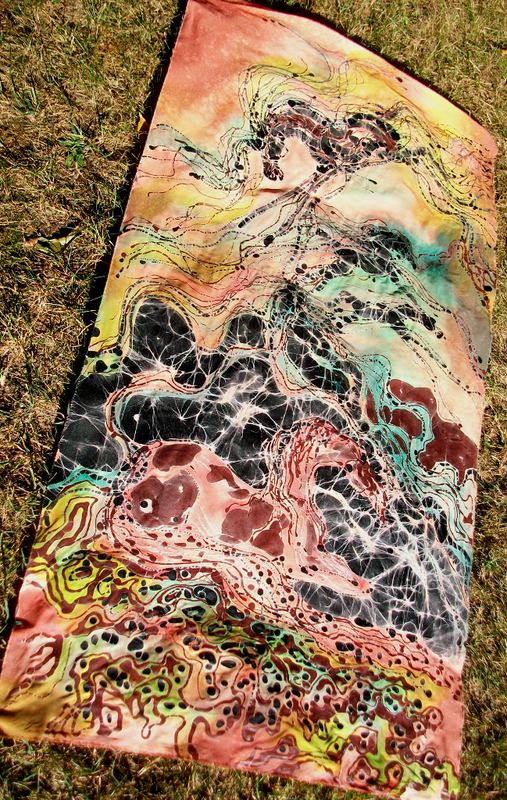 And below is the final batik, Caught in the Thunderstorm. A picture of the sky spirits, using the horse. It went in to several more dyebaths and I actually sprayed some bleach on it in sections to get a mottled effect. 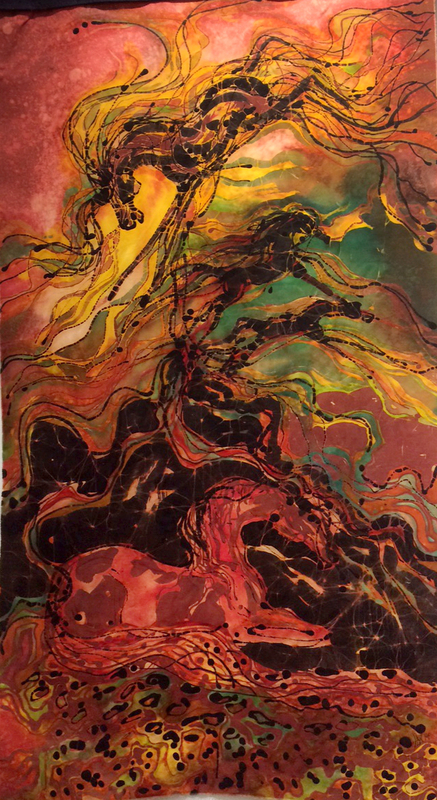 And finally, the wax was ironed out of the batik to achieve these interesting color combinations. 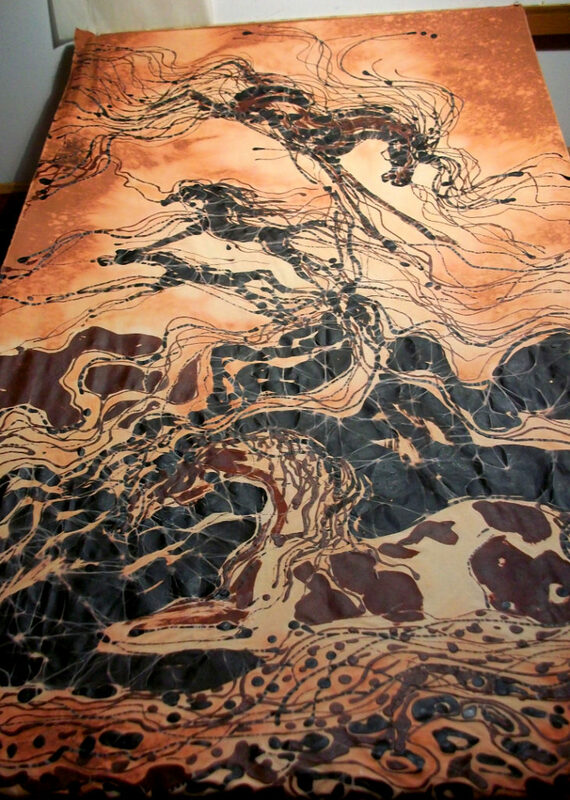 Batik requires the artist to think about the negative space, and it is even more of a challenge when starting with black fabric. One of the most challenging stages is the very first one, where you paint wax on the black fabric. It can be very difficult to see where you have painted the wax. I like this process. It is a bit more time consuming than starting with white fabric, but it has a very unique look, and I have done several batik in this style. 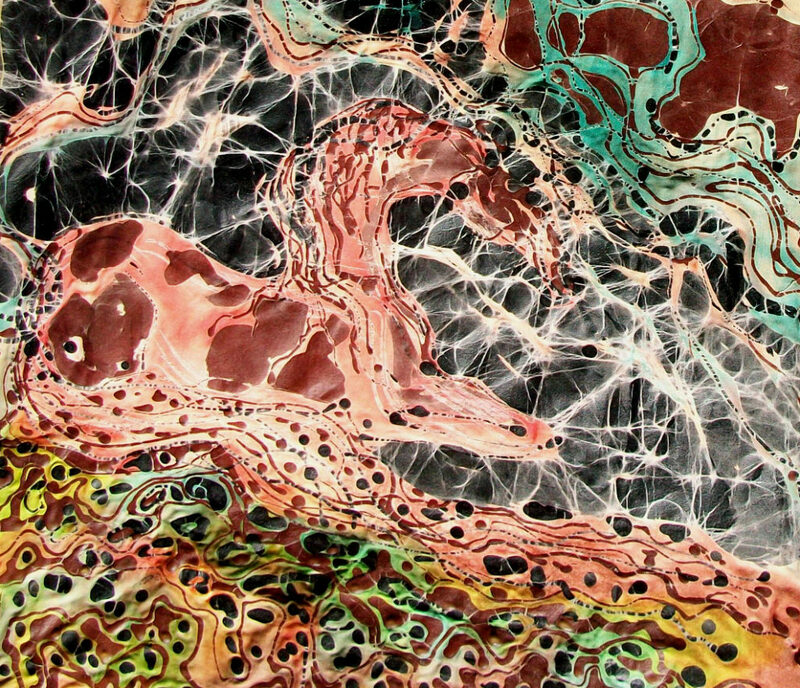 You can see my batik River Sunrise, Crows Alone, Horse Born of Earth Water and Sky, and Horse through a Web of Fire. Check them out in the Gallery section of the website. That is very very cool…so m much work is involved! just love your designs! Yes, my batik get quite complicated and messy, but I love the process. Batik is magical! I just love this…so much work is involved! !I never tried the black fabric..it’s almost doing it backwards! Thank you so much Donna! I so appreciate your admiring my art and your comments on my batik. This work is beautiful, I am new to batik and experimenting at the moment but your designs are so inspiring.